Jack Greenhough, whose 13 goals from right-back have helped Pontefract Collieries to the Toolstation NCE League championship. Hail Pontefract Collieries’ history makers. Craig Parry and Craig Rouse’s men crowned their brilliant season by earning promotion on Saturday and after another victory on Monday night they took another giant stride towards being officially crowned Toolstation NCE League champions for the first time. They were then confirmed as champions a night later when rivals Pickering Town could only draw 0-0 at Staveley MW. That left them still eight points behind Colls with only two games left. Ponte will now be looking forward to playing in the Evo-Stik League for the first time in the club’s history after sealing their fantastic promotion in style. After a memorable week in which they won four times in eight days, including beating long-time table toppers AFC Mansfield 3-0 at their place Colls had to go again when up against fourth-placed Handsworth Parramore on Monday, but there was no let up as a 3-1 success took the Pontefract side to the brink of their fully deserved championship. Ponte round up their season at Staveley MW tonight and are away to Athersley Recreation on Saturday when they will be looking to add to the 100 points that they brought up with the win at Handsworth. Jack Greenhough weighed in with another goal from right-back – his 13th in the league this season – as his well struck free-kick had Colls ahead at half-time. Vaughan Redford struck early in the second half before Mikey Dunn made it 3-0. A late goal from William Eades was just a mere consolation for Parramore. 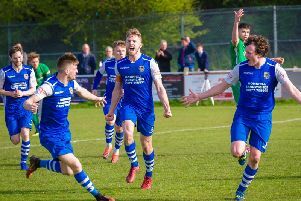 Collieries sealed their back-to-back promotion with a 2-0 win at Maltby Main last Saturday when Redford headed them ahead in the opening half and Aaron Moxam doubled the advantage late on to spark big celebrations among the large contingent of travelling supporters. They are only the third side in NCE history to win back-to-back promotions, after Houghton Main and more recently Shaw Lane. Last Wednesday was the big one for Pontefract as they came back from AFC Mansfield with three huge points after possibly their best performance of the season saw them run out 3-0 winners. Dunn, Moxam and Eli Hey were the scorers on a memorable night when they finally overtook Mansfield to go top. Assistant manager Rouse paid tribute to his players. He said: “Premier Division champions. What an achievement from this bunch of players. “We’re all delighted to have secured the club’s first ever promotion to the Evo-Stik League. “I’d just like to thank everyone who’s sent congratulations to the club, management and players. “There aren’t enough words I can use to explain the pride we have in the players. “In seven days we’ve travelled away to Bottesford, AFC Mansfield, Maltby and Handsworth taking maximum points, scoring 12 goals and conceding three.